I am a self-confessed clothes hoarder. Not in the piles-of-clothing-on-every-available-surface and clothing stored in the oven sense, but definitely in the multiple-IKEA-bags-stored-under-the-bed and no more room in my wardrobe sense. Or Mister Ruffles’ wardrobe for that matter. In fact if I’m completely honest it’s got to the point where our wardrobe doors no longer shut properly because the wardrobes are full to bursting with coats, shoes, shirts and ‘stuff’. The doors are permanently ajar, and at night and in the dark, it does freak me out a little bit. I still think monsters live in wardrobes. This is why every once in a while I have to have a mammoth purge, so my wardrobe doors can cleanly shut and I can sleep better at night. Mainly though it’s to create a more harmonious living environment with my dear boyfriend, who after months of my encroaching, is eventually at boiling point. And continuing the spirit of honesty, it’s to clear room for more clothes. 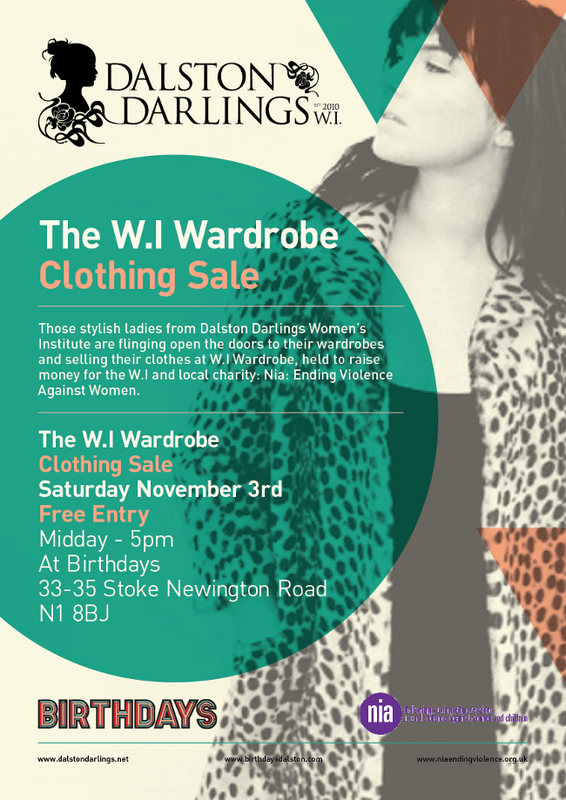 I’m fairly sure that this is the case for most ladies too and that is why on Saturday November 3rd The Dalston Darlings Women’s Institute are holding The W.I Wardrobe, a clothing sale to raise money for our nominated charity Nia Ending Violence Against Women, and an opportunity to purge the contents of our wardrobes …. and buy more clothes.